My name is Jonathan Dibben, I am 24years old and I ride for Team Sky. I have won a Worldchampionship and several European Championship Titles and National Championship Titles. 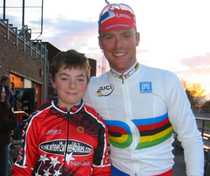 I started cycling after a friend of my parents introduced me and my brother to cyclocross. We got to ride around a muddy trail and given a Mars bar when we finished. We were hooked. I asked for bikes for birthdays and Christmases and we soon got to know the Hargroves, who have supported me pretty much since I started racing. Later we started racing at Mountbatten Cycle Track in Portsmouth. My brother was given a road bike by Phil Gough, unfortunately for him it was too small so I got it! In 2004 we went to Assen, JeugdTour, basically a week long holiday with some fairly serious racing thrown in. Meeting and racing with people from so many different countries was a great experience. The whole event is incredible and I decided then that I wanted to be a cyclist. After that we would go to Holland every year, spend a few days staying with our Dutch relatives in Veldhoven, then head to Assen.